The town, located in Boston's MetroWest, has a rich colonial history. The town was incorporated in 1639. At that time, the boundaries of Sudbury included (by 1653) all what is now of Wayland (which split off in 1780), and parts of Framingham, Marlborough, Stow and Maynard (Maynard split off 1871). The Sudbury Center Historic District has changed little since 1800. One of Sudbury's historic landmarks, the Wayside Inn, claims to be the country's oldest operating inn, built and run by the Howe family for many generations. Residentially, Sudbury's 1-acre zoning bylaws helped the town maintain a more rural character through the 1970s and 1980s, when developments of single-family Colonials and large Capes established it as an affluent location. Commercial growth was restricted to the town's main thoroughfare, US Route 20. 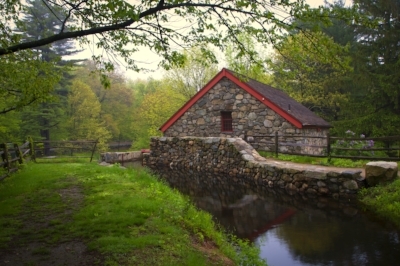 Significant tracts of open space—including much wetland—were preserved in the northern half of town and along the Hop Brook corridor flowing from the Wayside Inn Historic District in the southwest part of town through the King Philip Historic District (site of a conflict in King Philip's War) and into the Sudbury River at the southeast border with Wayland.